Let’s keep going… let’s bring a Cisco 3750E into the topology and let’s talk about utilizing Spanning Tree. Let’s get this out the way, Avaya does NOT recommend that you disable Spanning Tree. Avaya’s Split MultiLink Trunking (SMLT) is not compatible with the Spanning Tree Protocol so you can’t run STP over SMLT links. You can still run STP on edge ports and even ports utilizing MultiLink Trunking (MLT) or LACP/802.3ad. This is in contrast to Cisco’s Virtual Port Channel (vPC) which is interoperable with Spanning Tree. Again, that’s pretty straight forward and isn’t too exciting. Although if we leave every uplink/downlink as a member of VLAN 100 and VLAN 200 we’ll end up with a loop in our topology – not a Spanning Tree Loop. What if we add Multiple Spanning Tree Protocol (MSTP) to our configuration just to make it interesting? Our topology might look like this with 2 instances of MSTP running, one for each VLAN. We’ll make the Avaya switch the root bridge for CIST. We’ll make the Juniper switch the root bridge for MST 1, and we’ll make the Cisco switch the root bridge for MST 2. That’s interesting… let’s see what we need to-do in order to configure everything up. I’m going to pickup the configuration as I had it setup in the previous post, LACP Configuration Examples (Part 4). 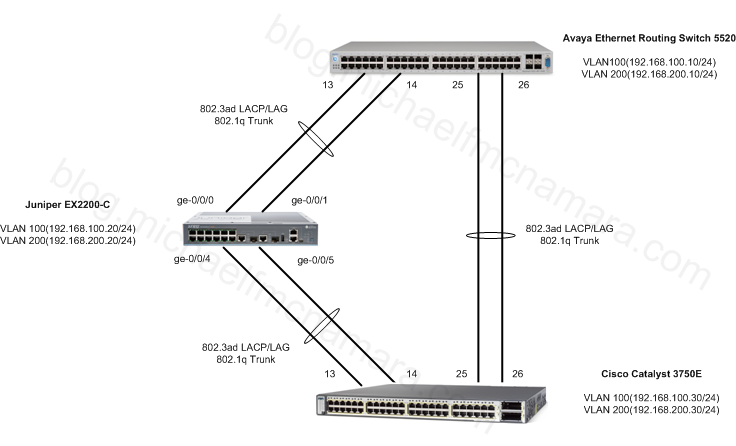 We’ll need to add another LACP group/pair to our Avaya and Juniper switches as well as configure the Cisco switch. We’ll also need to enable MSTP on each switch, add the VLANs to the correct MSTP instances and set the correct bridge priority for each. You’ll notice that the Avaya switch accepts a hexadecimal value for the priority, so 4000 in hex = 16384 in decimal. Let’s have a look at our work and see what everything looks like from both a LACP and Spanning Tree perspective. We can see that LACP is up and running to both the Avaya and Juniper switches. 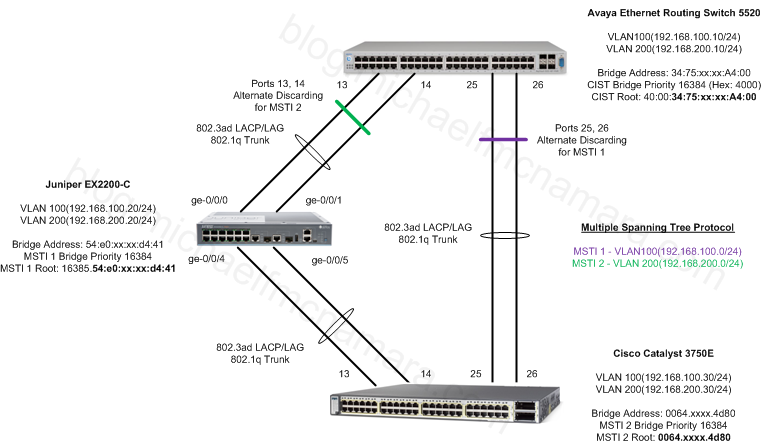 We can also see that the Cisco switch is the root bridge for MSTI 2 and the root port for MSTI 1 is Port-channel 1 (link to Juniper EX2200-C) while the root port for the CIST is Port-channel2 (link to Avaya ERS 5520). All ports are designated and forwarding traffic. We can see from the output above that ports 13,14 are Alternate Discarding for MSTI 1 while ports 25,26 are Alternate Discarding for MSTI 2. In the output we can see which port is the root bridge port for each switch, we can also see the MSTP config digest which should match on every switch in the topology. In order for the configuration to be valid the MST region name, version and config selector need to match along with correct VLAN IDs matched to the correct MST instance. As is usually the case at this time of the year I have some vacation time to burn. After all my choirs and mini projects I still have time left for tinkering, so this past week I opened the box on a Juniper EX2200-C switch. I’ve enjoyed configuring the deploying the Juniper SRX security gateway so I was eager to see what I could do with the EX2200-C. 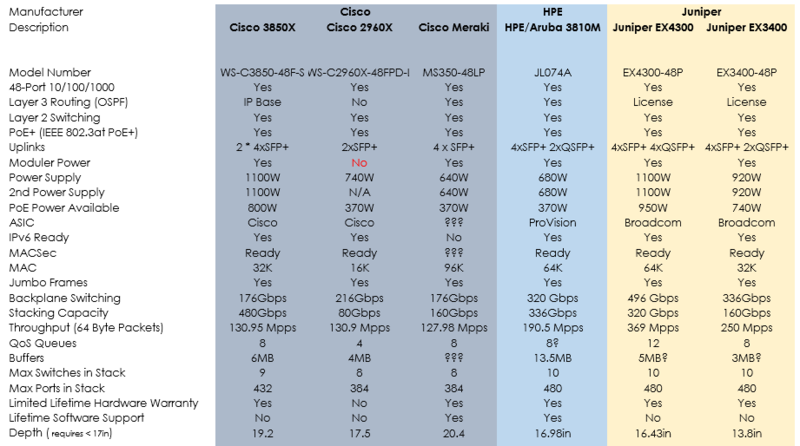 In the past I’ve demonstrated how to connect an Avaya Ethernet Routing Switch 8600 to an Avaya Ethernet Switch 470, an Avaya Ethernet Routing Switch 8600 Cluster to an Avaya Ethernet Switch 470 via SMLT, an Avaya Ethernet Routing Switch 8600 Cluster to a HP GbE2c(Blade Technologies) via SMLT, and even an Avaya Ethernet Routing Switch 5520 to Cisco Catalyst 3750E. 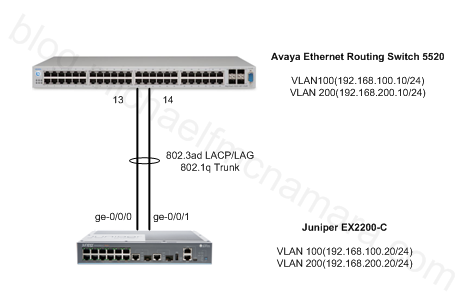 In this post I’ll demonstrate how to establish an LACP 802.3ad link over 2 Gigabit interfaces between an Avaya Ethernet Routing Switch 5520 and a Juniper EX2200C switch. This isn’t really rocket science but I’m continually getting questions from all four corners of the globe regarding LACP configurations. This is a pretty simple topology, we’ll connect ports 13 and 14 on the ERS-5520 to ports ge-0/0/0 and ge-0/0/1 on the EX2200-C respectively. We’ll create VLANs 100 and 200 and assign them IP interfaces in the 192.168.100.0/24 and 192.168.200.0/24 networks respectively. We’ll test connectivity by pinging from one switch to the other on each VLAN. 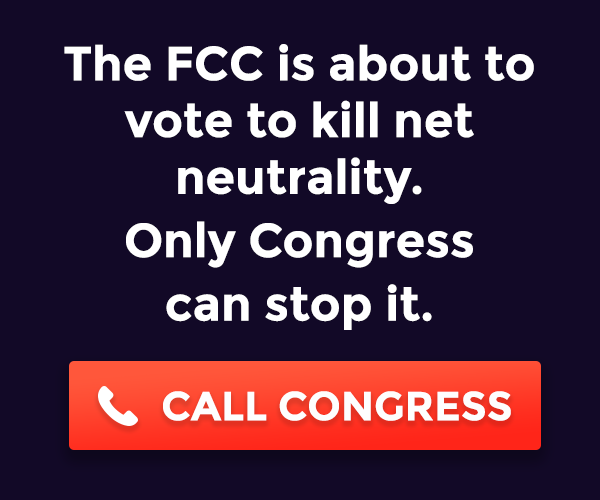 That’s really all there is to it… hopefully it’s pretty straight forward.